Hey I have something awesome for you! SK-II Cellumination Auractivator CC Cream helps activate your skin’s aura and unlock radiance from within at the SK-II #ChangeDestiny Light Museum. The Light Museum is currently up at the Centre Court, Suria KLCC from 24th Feb to 2nd March 2015. So do you want to win the new SK-II Auractivator CC Cream? Tadah! Here I have SK-II Auractivator CC Cream to giveaway to you all. 3 of my readers with the best-looking glow will win the SK-II Auractivator CC Cream worth RM274 each. All you have to do is follow these simple steps. How to win SK-II Auractivator CC Cream? 1. Visit the Light Museum @ Centre Court, Suria KLCC from 24th Feb to 2nd March 2015. 2. At the museum entrance you must mention the code “Sunshine Kelly” to experience the free Aura makeover with the new SK-II Auractivator CC Cream. 1. Open to ALL Readers in Malaysia & 18 years old and above. 2. Only valid for visit on 27 Feb,28 Feb,1 Mar & 2 Mar 2015 from 10AM - 10PM. 4. 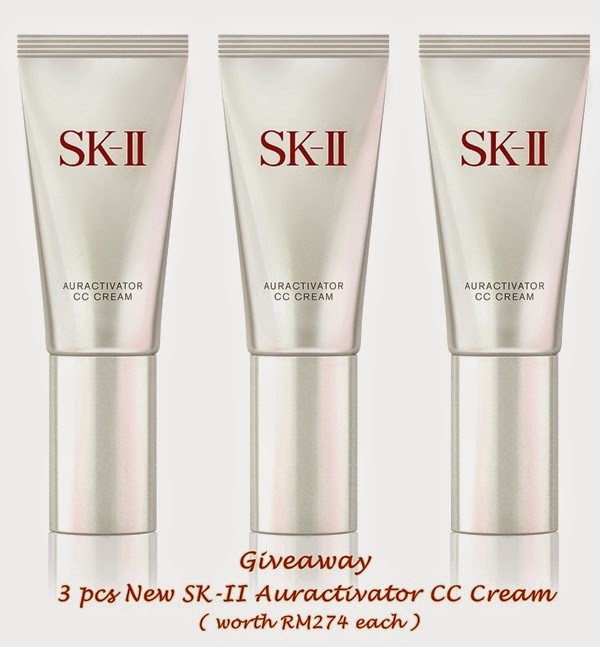 3 readers with best-looking glow will win the SK-II Auractivator CC Cream. 5. Contest period: 27 Feb - Mar 2 2015. 6. Prize will be delivered to winner direct from organizer. when visit the Light Museum for your free Aura Makeover. Hope you enjoy your aura glow with the new SK-II Auractivator CC Cream. I will definitely glow like jellyfish...ttoo many sleepless nite during cny. Wow... today is the last day!